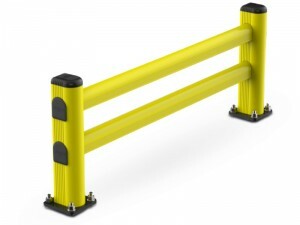 PVC Guard Fence are very durable, protecting the wall from impact, with high visibility color that has good warning function to folklift drivers. The PVC Guard Fence will reduce the damage to the wall and the folklift as well caused by impact loads. The solid body colour is permanently moulded in, eliminating the need for maintenance painting. Units are wear resistant and scratches.